Indiana’s climate and its manufacturing-heavy economy make it a prime user of energy. In fact, Indiana is the ninth-most energy-intensive state per capita in the country1. Nearly three-quarters of Indiana’s electricity comes from coal, and 5 percent is generated by renewable sources, though the wind energy sector is growing and coal use is declining2. This energy mix makes the Hoosier State the eighth-largest emitter of climate-changing gases, at 183 million metric tons of carbon dioxide (CO2) emitted per year3. As global and local climates continue to shift, it is important to know how Indiana’s future energy profile will be affected and what those changes mean for Hoosier families and businesses. 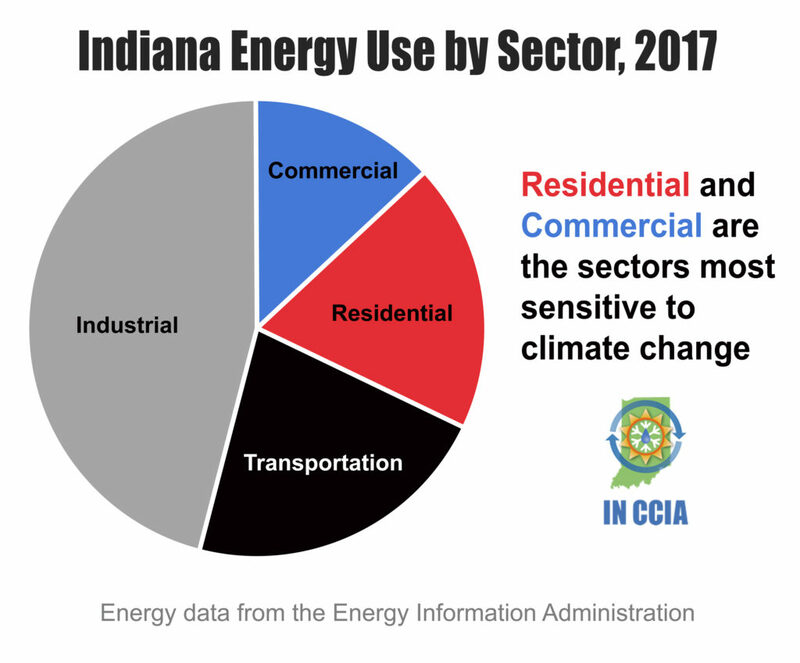 This report from the Indiana Climate Change Impacts Assessment (IN CCIA) looks at projected changes to Indiana’s residential and commercial energy demands as the state warms, and to Indiana’s energy supply over the coming century. The findings presented here are based primarily on the IN CCIA Energy Working Group technical report (Raymond et al., 2019) and two more detailed analyses from Energy Working Group members (Nateghi and Mukherjee, 2017; Wachs and Singh, in review). Overall residential energy consumption is expected to decline as the state’s climate warms. Average residential energy use in Indiana could drop by about 3 percent by mid-century and decline as much as 3.5 percent by late-century. This is because Indiana homes use more energy for heating than cooling. Projected changes in residential energy demand are similar for moderate and high climate change scenarios. However, the projected increase in demand for cooling is likely too low because the impact of expected increases in future humidity is not included in these estimates. Indiana’s commercial buildings are expected to see increases in overall energy consumption as the state warms – increasing demand about 5 percent by mid-century and up to 5.5 percent by late-century. This is because these buildings use more energy for cooling than heating. Projected changes in commercial energy demand are similar for moderate and high climate change scenarios. 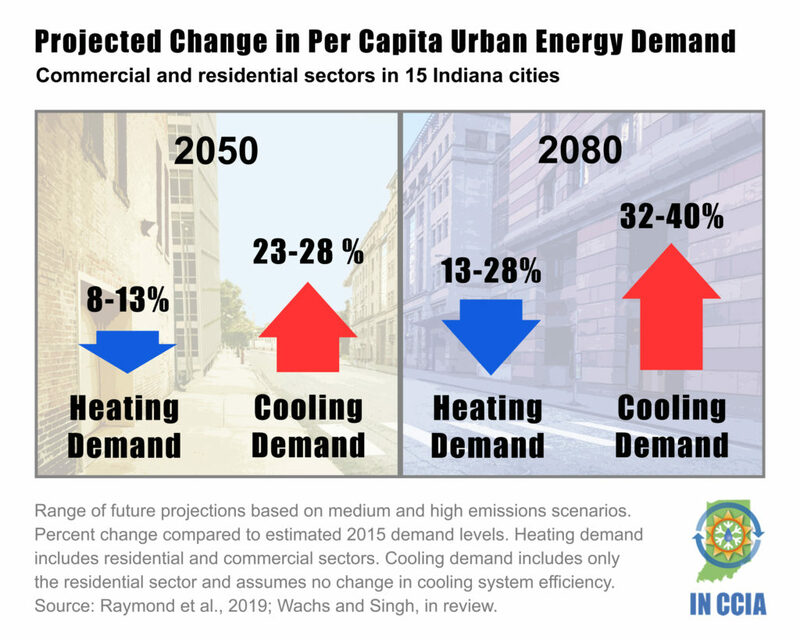 Per capita residential and commercial heating demand in Indiana’s 15 largest cities is projected to decline 8 to 13 percent by mid-century, with per capita heating demand falling as much as 27 percent by late-century compared with estimated 2015 demand. Per capita residential cooling demand in Indiana’s 15 largest cities is projected to increase 23 to 28 percent by mid-century, with per capita urban cooling demand rising up to 40 percent above 2015 levels by late century. Increases in future residential cooling demand are significantly moderated when improvements in cooling technology are assumed. Estimated changes in energy demand due to climate change have a minimal effect on predicted energy supply mix – less than a 1 percent shift across different climate scenarios by 2050, and less than a 3 percent shift by 2080. Coal use will continue to decline through midcentury in favor of natural gas and renewables, based on projected trends in fuel prices and technology change, and absent any future policy interventions. This shift away from coal is similar across all projected climate scenarios – showing the minimal influence of climate change on fuel mix relative to other factors – and is consistent across a wide range of possible fuel prices. The expected mix between natural gas and renewables, however, depends on future fuel and installation costs, which are uncertain. Based on conservative estimates for future renewables prices, about 50 percent of the state’s electricity would come from renewables by 2080, with higher renewable use likely if costs continue to decline at the rate observed over the last decade. Modest energy policies could have a large impact on Indiana’s long-term electricity supply mix. Adopting a carbon tax or renewable energy investment tax credits would accelerate Indiana’s energy transition, with an earlier shift to renewable sources (specifically wind energy) and a reduction in overall carbon dioxide emissions compared with no policy changes. In addition to supply and demand impacts, warming daytime and nighttime temperatures, increased extreme heat events, and shifting precipitation patterns will have cascading effects on power plant efficiency and capacity, fuel transport, transmission lines, and bioenergy production in Indiana and surrounding states. Indiana relies heavily on fossil fuels for energy production. According to the U.S. Energy Information Administration, Indiana is third in the country for coal consumption and seventh in coal production. Despite ranking seventh in coal production, Indiana holds only about 1.5 percent of the economically recoverable coal in the U.S. It consumes about three-quarters of the coal recovered in the state, while the rest is exported to about a dozen other states by rail, barge, and trucks. Indiana has recently shifted from being a net exporter to a net importer of energy, meaning Indiana utilities sell more energy than they generate4. This shift to more out-of-state energy production, along with lower energy demand resulting from efficiency gains, are the primary reasons Indiana’s (CO2) emissions have started declining over the last decade4. Combined, coal (73 percent) and natural gas (18 percent) made up about 91 percent of the state’s electricity production in 2017. Wind, blowing strong across Indiana’s wide-open agricultural landscape, generated 5 percent, with the remaining 4 percent coming from other gases, hydroelectric, solar, and biomass. Indiana’s energy landscape has been shifting quickly; as recently as 2009, natural gas produced only 3 percent of Indiana’s electricity, with 93 percent sourced from coal. Indiana’s industrial sector consumes about 46 percent of the state’s energy, with transportation (22 percent), residential (19 percent), and commercial (13 percent) accounting for the rest. Because research has shown that industrial and transportation sectors have limited sensitivity to climate change5, we focus our attention here on the expected changes in residential and commercial demand, which together account for one-third of the state’s total energy use. Our climate plays a critical role in many aspects of energy production, delivery, and demand. Seasonal fluctuations from hot summers to cold winters create significant needs for both space heating and cooling, while acute temperature swings (heat waves and cold snaps) can lead to short-term spikes in demand. Daytime and nighttime temperatures influence energy demand as well as power plant efficiency and transmission line capacity. Supplies of coal, oil, and natural gas are also sensitive to climate-related disruptions in transport; for instance, water levels changed by droughts and floods can stall barge traffic, and flooding can damage railroad lines and pipelines. Indiana’s climate has become warmer, wetter, and more humid over the last century (Widhalm et al., 2018). These trends are projected to continue, with winter and spring becoming warmer and wetter, and summer and fall becoming hotter and possibly drier. The Midwestern U.S., including Indiana, is also expected see a significant rise in the number of days with dangerous humidity levels (Hsiang et al., 2014). The state’s annual average temperature is expected to rise 5 to 6°F by mid-century and 6 to 10°F by late-century, depending on the amount of heat-trapping gases released to the atmosphere by human activities6. Warming conditions are expected in all seasons, and both daytime high and nighttime low temperatures are expected to rise. Extreme heat is also projected to become more frequent and intense. For instance, in southern Indiana, the daily high temperature is expected to exceed 95°F for 50 to 89 days per year by late-century, with more than 100 of these extremely hot days per year predicted for localized areas under a high-emissions scenario. For comparison, the southern third of the state historically7 has averaged about seven extremely hot days per year. Rising temperatures will increase the need for energy to cool homes and businesses. 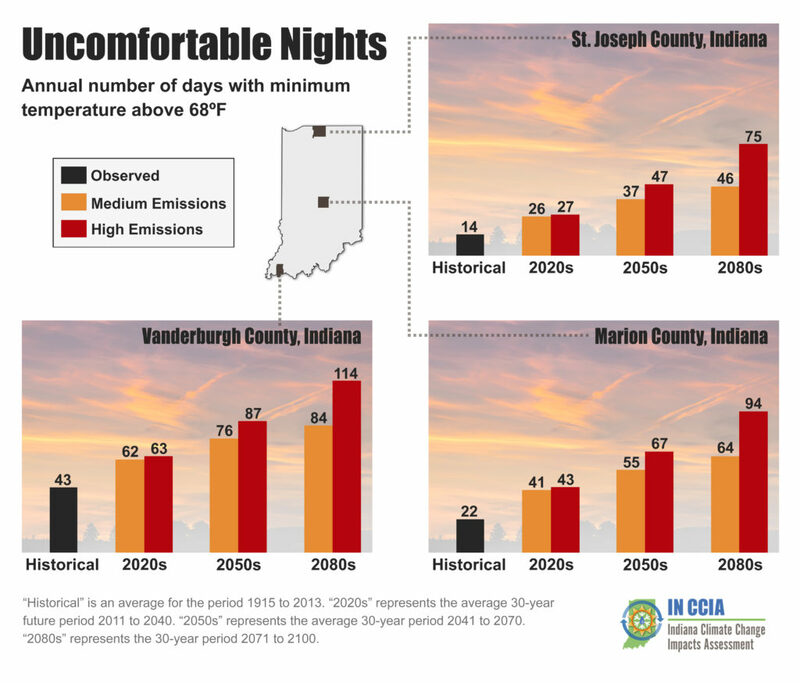 Indiana’s winter temperatures – an important factor in determining residential and commercial energy demand – are projected to warm about 5 to 6°F by mid-century. The average lowest temperature of the year is expected to rise by about 6°F in Indiana by mid-century compared with the average over the last century, with similar amounts from north to south. By mid-century, the northern third of Indiana will experience, on average, only six extremely cold days per year in which the temperature is below 5°F, down from 13 days in the past. Rising winter temperatures would decrease the need for heating homes and businesses. 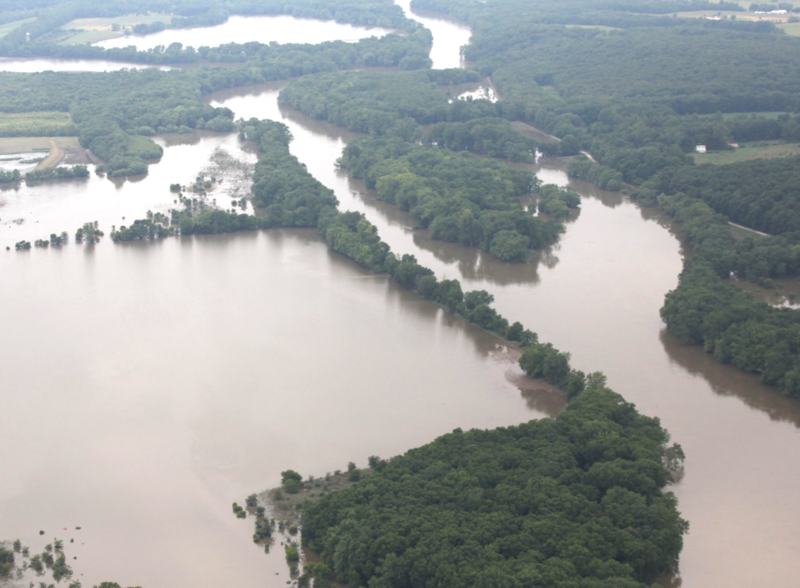 Statewide, annual precipitation is projected to increase 6 to 8 percent by mid-century and as much as 10 percent by late-century8, with more frequent heavy downpours. Winters and springs are likely to be much wetter by mid-century, while expected changes in summer and fall precipitation are less certain9. These analyses project changes to Indiana’s energy profile, including both demand and supply, based on expected changes to the state’s climate. 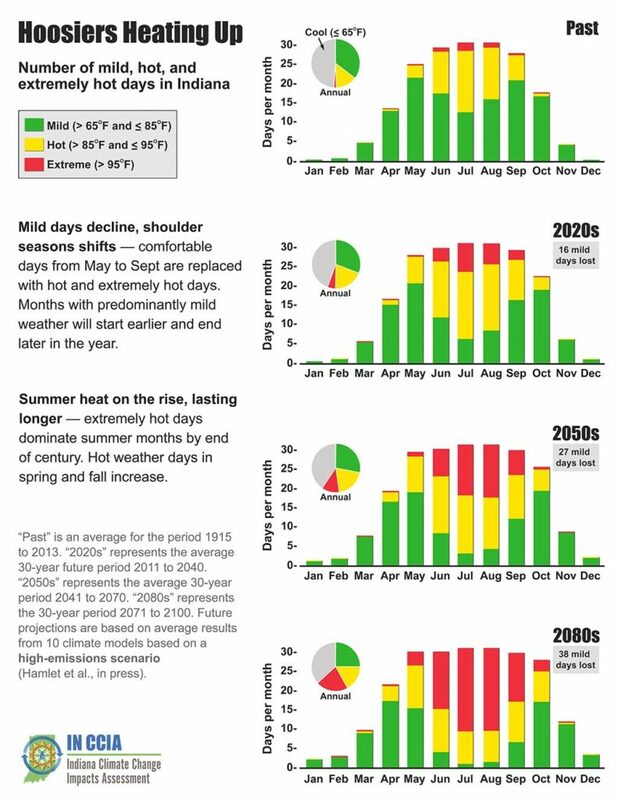 Future climate projections are from the Indiana Climate Change Impacts Assessment’s Climate Working Group (Hamlet et al., 2019). Three future greenhouse gas emission scenarios are considered – “low/no change,” “moderate,” and “high.” These scenarios follow Representative Concentration Pathways (RCPs) 2.6, 4.5, and 8.5, respectively, which have been used to develop many previous projections summarized by the Intergovernmental Panel on Climate Change10. The energy demand analysis focuses on the residential and commercial sectors because past research has shown that industrial and transportation sectors are comparatively insensitive to climate and are thus not expected to change significantly due to the projected climate changes through 2080. Our demand projections use different approaches to look at demand for the state as a whole and urban areas based on Indiana’s 15 largest cities11. Statewide demand projections were developed by Nateghi and Mukherjee (2017) using a “Bayesian” approach built from historical net energy demand and climate data, including a control for non-climate variables. Urban demand projections are based on published regression models that were developed in the scientific community12 and updated by Wachs and Singh (under review) for Indiana. These models create forecasts by estimating the typical relationship between heating or cooling degree days13 and changes in urban heating or cooling demand. Future energy supply sources are projected using the Market Allocation model from the U.S. EPA, as tailored for Indiana (IN-MARKAL). IN-MARKAL selects optimal energy sources for a given level of future end-use demand across all sectors of the state economy, based on projected fuel prices and costs of energy technology (ranging from heating and cooling systems in buildings to large-scale electricity generation infrastructure). For this report, existing research on Indiana’s future energy demand and supply based on projected fuel prices and growth rates (Lu 2015) was used in conjunction with projected energy demand and supply shifts in the commercial and residential sectors due to climate change from the statewide Bayesian analysis (Nateghi and Mukherjee 2017). IN-MARKAL is also used to evaluate expected changes in the electricity generation sources, especially the relative growth of renewables, based on two policy scenarios: a tax on CO2 emissions of $40/ton and an investment tax credit for renewable energy infrastructure. Heating is the largest source of energy demand in the residential sector and uses three times more energy than cooling demand. In the commercial sector, cooling demand is a bigger part of total energy demand than heating, in part due to commercial buildings being more heavily used during daytime hours when temperatures are warmer. These ratios are quite important to the different expected changes in energy demand for the two sectors from climate change. Hoosiers’ furnaces use far more energy per year than their air conditioners or other space-cooling appliances. Because of that, minimum winter temperature is the most important factor influencing residential energy demand. Predicted changes in annual and seasonal temperatures and precipitation are readily available. However, there are other climate factors that also affect energy demand that are not readily available. For instance, higher wind speeds in spring and fall increase heating demands, but projections of these wind speeds are limited. Humidity, storm frequency, and storm intensity also influence residential energy demand, but these variables are not commonly available from future climate projections. Excluding changes in humidity (which is expected to increase throughout this century) from future residential demand projections is likely to cause an underestimation of demand for cooling. Factoring in only projected changes in maximum and minimum seasonal temperatures and precipitation, under both the moderate- and high-emissions scenarios, net energy demand for the average Indiana household would decrease by 2.8 percent and 3.0 percent, respectively, by mid-century compared with a “no climate change” scenario. By late-century, the decreases are projected to be 3.2 percent and 3.5 percent, respectively. It is important to note that changes in energy demand are not uniform across the state or by energy users in the same location. Projections are for average consumers and could be more significant for users on the high or low ends of the demand spectrum. 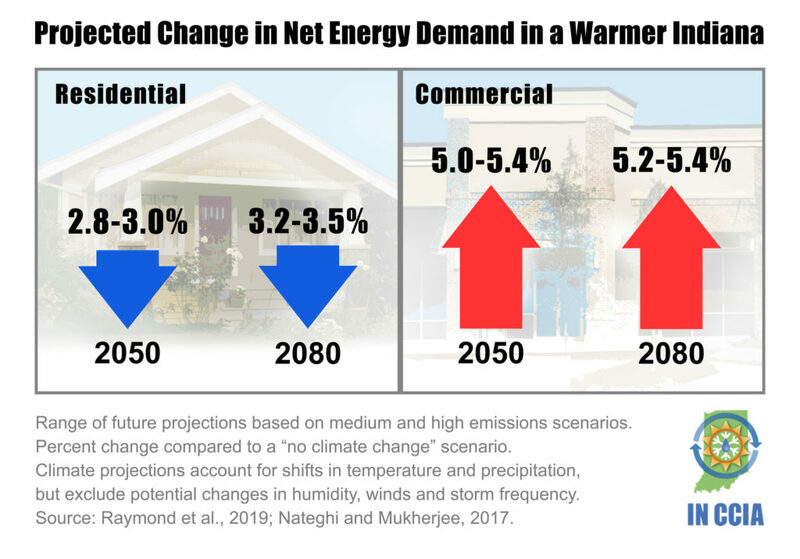 Above: Projected changes in statewide residential and commercial net energy demand for mid- and late-century. Percent change is compared with a “no climate change” scenario. Range of future projections are based on medium and high-emissions scenarios. Decreases in residential demand and increases in commercial demand are due primarily to varying importance of space heating and cooling in the two sectors. In contrast to the residential sector, cooling, rather than heating, is a greater proportion of energy use in the commercial sector. However, non-climatic factors such as economics and population growth, and changes in technology, are more influential in predicting future commercial energy demand compared with climate-related factors. The climate factors most relevant to the commercial sector include winter wind speeds and minimum temperature in winter, which are associated with higher heating demand, as well as the maximum temperatures in the fall and spring, which are associated with higher cooling demand. Based on future climate estimates, including increased summer temperatures, the average commercial building in Indiana is projected to use 5.0 to 5.4 percent more energy by mid-century, and 5.2 to 5.5 percent more energy by late-century. As with the residential projections, the omission of humidity projections may also make these cooling projections too conservative. When the mercury rises, so, too, does energy demand. In today’s climate, extreme heat events are typically short-lived and infrequent, and peak energy demand will rarely exceed available supply. By mid-century, however, Hoosiers are expected to see five to seven times more extreme heat days per year14, which puts our state’s reliable energy at risk. While future estimates of Indiana’s net energy demand – average over an entire year for the whole state – may seem modest, it’s important to realize there will be substantial variability at the individual household/building level. This is especially the case for southern Indiana, which could experience unprecedented spikes in cooling demand during hot spells. Unanticipated surges in energy demand during heat waves can result in significant electricity price spikes and supply shortages. Unless suppliers proactively plan to manage unprecedented peaks in demand, periods of unserved demand, such as those during recent heat waves in the state of California, could become a new reality for Hoosiers. Urban centers account for a majority of the residential and commercial energy use worldwide (International Energy Agency 2016), and cities have distinct energy consumption patterns that differ from more rural areas (Norman et al. 2006). Indiana’s 15 largest cities are significant energy users, containing 75 percent of the state’s population. Using our regression models, we estimate expected changes in per capita residential and commercial heating demand and per capita residential cooling demand in each city. As with our statewide projections, we expect per capita heating demand to decrease and cooling demand to increase in these cities. A city’s location will play an important role in its energy usage. Cities north of Indianapolis, for example, will increase cooling demand more than those to the south for two reasons. First, the more northern cities will experience a higher percentage increase in “cooling degree days13” (for instance, Michigan City in the north will experience a 114 percent increase from 2015 to 2080 under high emissions, compared with a 75 percent increase to the south in Evansville). 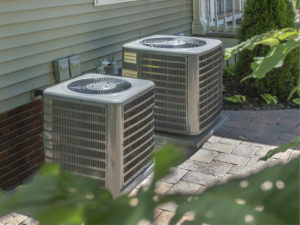 Second, air conditioning has not yet been adopted as widely in northern cities as in the southern portion of the state, and that will likely change in the future. 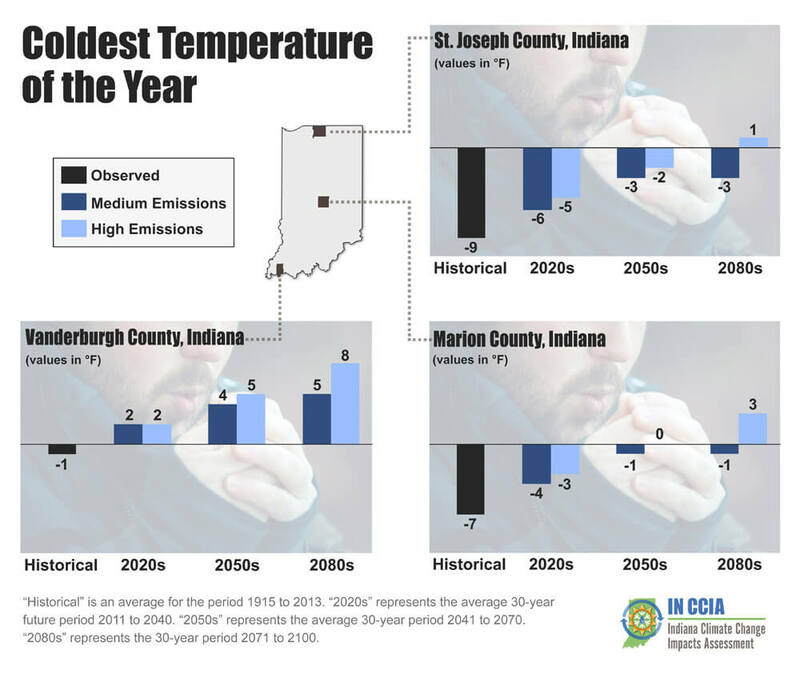 Per capita residential and commercial heating demand for Indiana’s largest 15 cities is expected to fall 8 to 13 percent by mid-century15, depending on the emissions scenario. By late-century, per capita heating demand is projected to decrease by about 13 to 28 percent. Assuming no change to air conditioning efficiency, average per capita residential cooling demand is projected to increase 23 to 28 percent by mid-century, and 32 to 40 percent by late-century for these 15 cities15. If air conditioners become more efficient, these future cooling demands would be smaller. For example, in the model incorporating efficiency improvements, per capita cooling demand increases by only zero to 7 percent by late-century15. However, future improvements in efficiency are uncertain. The EPA Market Analysis Model tailored to Indiana – IN-MARKAL – projects future energy supply choices considering technological, environmental, economic, and policy constraints. Coal, natural gas, petroleum products, biomass, and renewable electricity from wind, solar, municipal solid waste, landfill gas, and hydropower are included as potential electricity sources. The analyses, which have a 2019 starting point, are based on assumptions of moderate future price increases for coal and slow increases in natural gas prices as informed by the latest EIA and EPA analyses. The projections assume relatively flat prices in solar and wind installation, which are probably an over-estimate of future costs given the recent rapid declines in wind and solar installation prices16. Given these uncertainties of projecting fuel and technology prices through 2080, we also discuss the sensitivity of our projections to alternative future energy prices. Although the IN-MARKAL model incorporates the best available projections for new energy technologies, there are several potentially revolutionary innovations in energy production that could significantly alter our projections for the state’s future energy mix. For example, significant investments in research and development on centralized solar generation and accompanying storage solutions such as pumped water supplies, as well as distributed generation options relying on local renewable energy sources, new strategies for using waste heat to generate electricity, fuel cell research, and even new nuclear energy technologies have the opportunity to transform energy production in the future in dramatic and unpredictable ways (Davis et al. 2018; NREL 2012; Pacala and Socolow 2004). In addition, major investments are being made on the demand side in terms of high-performance buildings, including heating and cooling systems, smart appliances, and smart grids and meters for delivering electricity more efficiently that could also disrupt energy consumption patterns in unpredictable ways (Lovins 2018). It is important to recognize that the projections of future energy sources in this report are also sensitive to uncertainty about the possible commercial adoption of some of these disruptive energy technologies over the next 50 years. The rate of climate change has little effect on Indiana’s projected future energy supply. 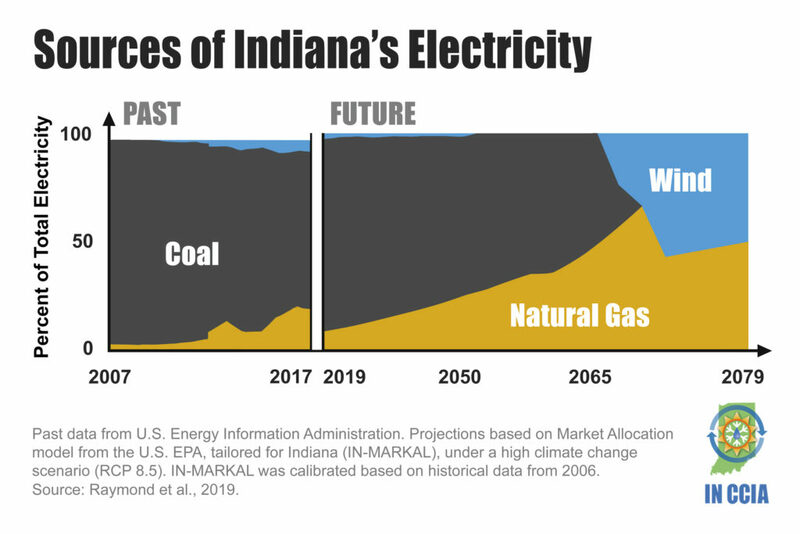 In the minimum climate change scenario, Indiana is projected to use about 65 percent coal and 35 percent natural gas – with less than 1 percent of energy coming from all other sources – to generate electricity by 2050. By 2080, about 51 percent of the state’s electricity supply would come from natural gas and about 48 percent from wind power, with the remainder coming from other sources. Under both the moderate and high climate change scenarios, the electricity mix remains virtually the same as the minimum climate change scenario throughout the century, which is not surprising given the small projected effects on statewide net energy demand in the commercial and residential sectors. In 2050, under both climate scenarios, there is a less than 1 percent difference from the “baseline” scenario in natural gas output, and no movement to wind power by 2050. In 2080, there is less than a 3 percent difference from the baseline scenario in both natural gas and wind power supply under both the moderate and high climate change scenarios. Above: Past data and future projections showing the percentage of total electricity generated by source type in Indiana from 2007 to 2079. Past data are from the U.S. Energy Information Administration. Future projections are based on the Market Allocation model from the U.S. EPA, tailored for Indiana (IN-MARKAL), under a high climate change scenario (RCP 8.5). Source: Raymond et al., 2019. The likelihood of switching from coal to natural gas and wind power is strong across the model projections for all three climate scenarios. In each scenario, all coal plants are retired by 2058 when they have reached the end of their current lifespans and due to projected costs of natural gas and renewable energy compared with coal. This projected shift away from coal is consistent across a wide range of possible future fuel prices, including a coal price of $0, no future increase in natural gas prices, and natural gas prices ranging from 50 percent to 200 percent of our projections. Bottom line: Even in the extreme cases, the long-term trend of coal phasing out holds up. The future price for natural gas, however, is critical for determining the proportion of future supply sourced from natural gas and wind. If the price of natural gas did not increase at all over the modeling timeframe, for example, it would be expected to replace wind power entirely in the high climate change scenario. If natural gas prices were twice as high as in the base model, by contrast, renewables would rise to over 80 percent of production by 2080 with gas reduced to under 20 percent in the same scenario. The share of electricity supply from solar versus wind generation is much more uncertain. The installation costs of both technologies have declined rapidly since the 2006 data used to calibrate the model. Given this recent trend, the model’s costs for solar and wind are higher than one might expect, especially for solar, making the overall estimate of the market share for renewables a conservative one, and the projection of wind over solar very uncertain.The primary message is that, even based on a conservative estimate of future installation costs, renewables are likely to be a major portion of the state’s electricity production by mid- to late-century, if not earlier. Carbon taxes and renewable energy investment tax credits are considered effective ways of reducing emissions of climate-changing gases. Analysis suggests that adopting even a modest carbon policy can have a significant impact on Indiana’s long-term electricity supply mix. 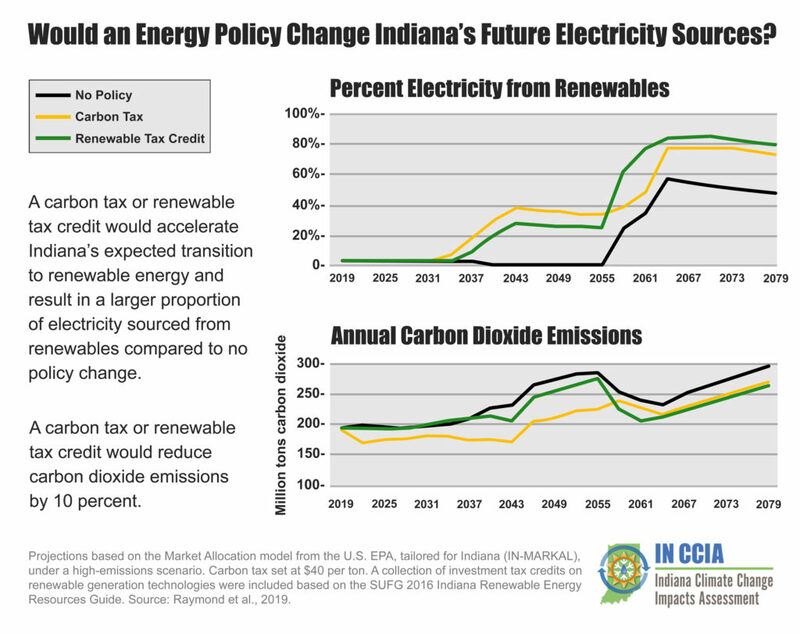 Adopting a carbon tax or renewable energy investment tax credits would accelerate Indiana’s energy transition to renewable sources and a reduction in overall carbon dioxide emissions compared with no policy changes. Carbon taxes are levied on the carbon content of fuels – coal, natural gas, petroleum products, etc. The tax is meant to capture the costs to society of the carbon emissions from those fuels and to provide an incentive for reducing emissions. The revenue obtained from the taxes can be used in a variety of ways; for instance, redistributed evenly to all taxpayers, used to offset the higher fuel costs for some consumers, or used to incentivize investment in renewable technologies and programs to improve climate change resilience. Tax credits for investment in renewable energy source slower the effective cost of these renewable energy generation options. These tax benefits are expected to spur adoption of these zero-carbon energy options. As of 2018, renewable tax credits or similar policies to promote renewable energy production have been adopted in a majority of states, while 11 have adopted some form of a carbon tax. In Indiana, this analysis shows that both policies would have significant impacts on electricity generation and carbon emissions. Under the high-emissions scenario, a $40 (per ton) carbon tax would increase wind generation from zero to 35 percent of the state’s energy supply in 2050 and from 48 to 73 percent in 2080, relative to having no carbon tax. From 2021 to 2080, this carbon tax reduces projected carbon dioxide emissions by an average of 10 percent per year. Above: Effects of various energy policies on the percent of Indiana’s future electricity generated from renewable energy and Indiana’s annual CO2 emissions. Projections based on the Market Allocation model from the U.S. EPA, tailored for Indiana (INMARKAL), under a high-emissions climate change scenario (RCP 8.5). Carbon tax set at $40 per ton. A collection of investment tax credits on renewable generation technologies were included based on the SUFG 2016 Indiana Renewable Energy Resources Guide. Source: Raymond et al., 2019. The renewable investment credits achieve similar results, with wind power increasing more slowly at the beginning, but faster over time. From 2021 to 2080, a renewable tax credit would cut carbon dioxide emissions by an average of 6 percent per year, with larger annual reductions than the carbon tax starting in 2065. While the carbon tax has little effect on total electricity production, it pushes faster adoption of renewable energy technology, specifically wind power. Renewable investment credits would increase electricity generation because they decrease the capital costs associated with investment in renewable technology. While the majority of this report details the direct impacts expected from climate change on supply and demand for energy throughout the 21st Century, shifting climate patterns can affect energy in many other ways that could impact supply, demand, pricing, infrastructure, and more. The following list summarizes some of these climate change vulnerabilities to the energy system in the Midwestern U.S. based on a 2015 report from the U.S. Department of Energy17 and other sources (where noted below). Power plants are less efficient at converting coal, natural gas, and biomass into electricity when operating at higher air temperatures. As average and extreme temperatures significantly rise over this century, reduced efficiency is likely to reduce power-generation capacity. Power plants take in water from rivers and streams for use in power plant cooling towers. As water temperatures rise, power plants may have to reduce power generation to stay below temperature limits for cooling water returned to waterways. Drier summers may limit water availability for use in power plant cooling towers, affecting operations and power plant capacity. More frequent heavy precipitation events and flooding may damage facilities and disrupt operations. Extreme precipitation and flooding could damage and disrupt fuel transport infrastructure such as railroads, waterways, docks, bridges, and roadways. More frequent and intense heat waves may damage infrastructure and disrupt commodity transportation. Floods and droughts may affect river and lake water levels, disrupting barge transportation of energy products. Higher average and extreme temperatures, including higher nighttime temperatures, would reduce the capacity of energy transmission lines and substations, potentially causing energy disruptions. Higher extreme temperatures may shorten the life times of transformers and their overloading capacity. Electricity outages often result from high winds, severe storms, and icing events. Only recently have scientists begun using climate models to estimate changes in storm activity. Early projections suggest an increase in the frequency and intensity of storms, which would affect the reliability of electric grids, but considerable uncertainty remains (Gensini and Mote 2014; Hoogewind et al., 2017). Crop yields could have short-term increases from higher atmospheric CO2 and a longer growing season, but these gains will likely be offset by increased stress from heat, water deficits, weeds, diseases, and pests. Climate change is projected to reduce Indiana corn yields by 16 to 20 percent by mid-century without improvements in crop genetics and management (Bowling et al., 2018). Fewer freezing days, as well as a longer frost-free growing season, could expand the range where biofuel crops could be grown. While these analyses are the best projections that can be made with the models and data available, it is important to recognize that climate change will have additional impacts on the state’s energy system beyond what is captured here. One important gap is climate change’s direct effects on energy reliability and infrastructure. Potential changes in storm intensity and frequency pose important but uncertain threats to maintaining a reliable energy supply and may require changes in generation and delivery infrastructure. Also unknown is how shifting river levels and water availability may threaten the state’s existing electricity infrastructure, which is largely located along major waterways and vulnerable to both high and low flows. Also, critical indirect consequences of climate change on energy demand are simply unknown, such as potential shifts in population due to people moving into the state from areas affected by rising sea levels or severe droughts. Beyond the need for more understanding of how climate change might affect energy infrastructure, there are other important gaps in our ability to predict future energy technologies. As discussed above, unpredictable major improvements in energy technologies could significantly alter Indiana’s energy demand and supply. For example, new advances in lower-cost renewables and storage technologies could tilt supply further away from fossil fuels as a source of energy beyond the trends predicted here, while rapid adoption of new technologies such as electric vehicles could increase electricity demand beyond our estimates. There are also common policy options that we could not evaluate in this effort, such as policies to increase energy efficiency in the residential or commercial sectors, or to invest revenue from a carbon price into energy efficiency or on-site renewable energy technology for consumers. These policies are becoming more common and merit new research to estimate their expected impacts on both emissions and the spread of zero-carbon energy technologies. Changes in energy demand and supply also have broader economic and health impacts that should be considered carefully. How might changing Indiana’s energy policies affect job growth and economic development, or state budgets? What are the likely health benefits from phasing out coal-based electricity? These are additional impacts that should be considered, building from the initial analysis presented here. Our analysis indicates that climate change will have mixed impacts on Indiana’s energy demand and supply. Residential energy demand is expected to decline by about 3 percent, due to the importance of heating in that sector, while commercial demand is expected to increase by about 5 percent, due to the greater reliance on cooling in that sector. Changes in per capita demand in the state’s urban areas follow a similar pattern, with 8 to 28 percent decreases in residential and commercial heating demand and 18 to 38 percent increases in residential cooling demand due primarily to warmer summers and winters. At the same time, our analysis projects that changes in energy demand have a small impact on the projected energy supply mix, which is influenced much more by projected trends in future fuel and technology prices. In this respect, we project that coal is likely to be replaced as a source of electricity by natural gas, wind, and/or solar by 2080, due mainly to expected trends in fuel prices and technology costs. We also illustrate how modest policies such as a low carbon price or an investment tax credit for renewable energy could shift the distribution of future energy supply even more heavily in favor of low- or zero-carbon energy options. In addition, we note other important potential effects of climate change on energy infrastructure. These include possible limits on generation due to changes in the availability and temperature of water for cooling, greater threats to power lines and other infrastructure from higher temperatures and potentially stronger storms, and changes in the use of biomass as a feedstock due to impacts on crop yields. Davis, S.J., Lewis, N.S., Shaner, M., Aggarwal, S., Arent, D., Azevedo, I.L., Benson, S.M., Bradley, T., Brouwer, J., Chiang,Y.M. and Clack, C.T. (2018). Net-zero emissions energy systems. Science, 360: eaas9793. Hsiang, S., Kopp, R. Jina, A., Delgado, M., Rising, J., Mohan, S., Muir-Wood, R., Rasmussen, D.J., Mastrandrea, M., Wilson, P., Larsen, K., and T. Houser. (2014). American Climate Prospectus: Economic Risks in the United States. Lovins, A.B. (2018). How big is the energy efficiency resource? Environmental Research Letters 13 090401. Lu L. (2015). An assessment of the efficacy and cost of alternative carbon mitigation policies for the state of Indiana. Dissertation, Purdue University. McNeil M., Letschert V., de la Rue du Can S. (2008). Global potential of energy efficiency standards and labeling programs. Ernest Orlando Lawrence Berkeley National Laboratory, Berkeley. Nateghi R., Mukherjee S. (2017). A Multi-Paradigm Framework to Assess the Impacts of Climate Change on End-Use Energy Demand. PLoS One 12(11): e0188033. National Renewable Energy Laboratory (NREL). (2014). Renewable electricity futures study. Hand, M.M, Baldwin, S., DeMeo, E., Reily, J.M., Mai, T., Arent, D., Porro, G., Meshek, M., Sandor, D., eds. 4 vols. NREL/TP-6A20-52409. Golden, CO: National Renewable Energy Laboratory. https://www.nrel.gov/analysis/re-futures.html. Pacala, S and R. Socolow. (2004). Stabilization wedges: solving the climate problem for the next 50 years with current technologies. Science, 305(5686): 968-72. Singh S., and C. Kennedy. (2015). Estimating future energy use and CO2 emissions of the world’s cities. Environmental Pollution 203:271–278. Singh, S., and E. Wachs. (in review). Projecting Urban Energy Demand in Indiana for 2050 and 2080. Climatic Change. Wachs, E, Singh S (in review) Estimating spatial variations of urban energy demand in Indiana under future climate change scenarios. Climatic Change. 1 U.S. Energy Information Administration (EIA), SEDS Database, Table C13. Energy Consumption Estimates per Capita by End-Use Sector, Ranked by State, 2016. 2 See State Utility Forecasting Group 2017 Indiana renewable energy resources study. 3 U.S. Energy Information Administration (EIA), Rankings: Total Carbon Dioxide Emissions, 2016. 5 Numerous studies have shown the industrial and transportation sectors to be comparatively insensitive to climate variations. Full listing of research references is provided in Raymond et al. 2019, page 2. 6 Projected change in temperature averaged across 10 climate models for two scenarios of heat-trapping gas emissions based on analysis by Hamlet et al. (2019) and Widhalm et al. (2018). Mid-century refers to the 30-year period from 2041 to 2070. Late-century refers to the 30-year period from 2071 to 2100. Future temperature changes are relative to the statewide annual average temperature from 1971 to 2000. Further details provided in Widhalm et al. (2018). 7 Historical period from 1915-2013. 8 Projected change in precipitation averaged across 10 climate models for two scenarios of heat-trapping gas emissions based on analysis by Hamlet et al. (in press) and Widhalm et al. (2018). Mid-century refers to the 30-year period from 2041 to 2070. Late-century refers to the 30-year period from 2071 to 2100. Future precipitation changes are relative to the statewide annual precipitation from 1971 to 2000. Further details provided in Widhalm et al. (2018). 10 RCP 2.6 implies rapid transition away from carbon emissions and suggests relatively small changes to the future climate. This scenario is considered unlikely by climate scientists since trends show greenhouse gas accumulation making changes to the climate already. However, it serves as a baseline for this report to show how the energy sector would evolve if there were only minimal climate changes. A medium-emissions scenario, RCP 4.5, would require greenhouses gas emissions to peak by the 2040s before declining. The high-emissions scenario, RCP 8.5, is close to our current trajectory but expects greenhouse gas emissions to increase unabated through the majority of the century. 11 Cities were: Bloomington, Cincinnati (IN portion), Columbus, Elkhart-Goshen, Evansville (IN portion), Fort Wayne, Gary, Indianapolis, Kokomo, Lafayette, Louisville (IN portion), Michigan City – LaPorte, Muncie, South Bend – Mishawaka (IN portion), and Terre Haute. 12 Regression models for predicting per capita urban heating demand were developed by Singh and Kennedy (2015). Regression models for predicting per capita urban cooling demand were developed by McNeil and Letschert (2008). Cooling demand estimates include future adoption and use of air conditioning technology based on projections of future per capita income. 13 According to the U.S. EIA, “A degree day compares the mean (the average of the high and low) outdoor temperatures recorded for a location to a standard temperature.” The report uses 65°F standard temperature. Days with average temperature above (below) 65° F count as cooling (heating) degree days. 14 Extreme heat defined as days with a high temperature above 95°F. Range of projections based on a medium- and high-emissions scenario. 15 Projected change is compared with estimated 2015 demand. We thank Brian Wallheimer for drafting this report, Stan Coffman for assistance with graphics, and staff from Purdue University’s Department of Agricultural Communication, including Kyle Brock, Steve Doyle, Morgan Grosso, Maureen Manier, Russell Merzdorf, Nick Rogers, and Erin Robinson, for help with the production and release of the report. We are grateful to Nina Collins and Marcia Wilhelm-South from the Purdue University Libraries Scholarly Publishing Division for online publication support for all documents associated with the IN CCIA. Support for this research was provided by the Purdue Center for the Environment, the Purdue Climate Change Research Center, the National Science Foundation grants #1728209 and #1826161, and the USDA National Institute of Food and Agriculture Hatch project 1016213.